There once was an era where transportation planners believed cars zipping along highways was the sustainable future of transportation. They thought every problem could be solved by more highways with more lanes. Some even believed stacking highways ever-skyward was not only an inevitable but desirable urban future. They were wrong. Since then, we’ve learned about things like pollution, induced demand, and the effects building gigantic impassable barriers across our cities have on neighborhoods. Plus, cities are no longer places the rich and powerful wish to merely drive through, but places many people desire to live. With their growing populations, it seems both dumb and bad to have large swaths of the city occupied by ways to traverse it. But now more and more organizations are calling not only to stop building new highways through cities, but to tear down existing ones. In a new report, Congress for the New Urbanism, a national group dedicated to more walkable cities, identified 10 “freeways without futures” across the United States that it, in conjunction with local groups, argue should be torn down. The report is replete with the usual references to Robert Moses and Jane Jacobs, but it goes beyond their notorious fight, highlighting how neighborhoods can be re-connected and street space more accommodating by replacing outdated highway designs. As cities consider what to do with their aging in-city highways, they should recognize the opportunities for freeway removal and transformation. As the ten projects in this report demonstrate, cities can save money while boosting their economies and improving the lives of citizens by not repeating the mistakes of the 20th Century. Ironically, the group argues tearing down infrastructure once considered vital for economic growth would actually spur economic growth. Part of this is because the highway sections constructed mid-century are ending their useful lives and would require a lot of money to maintain. Any money not spent on the highway could go towards other things. 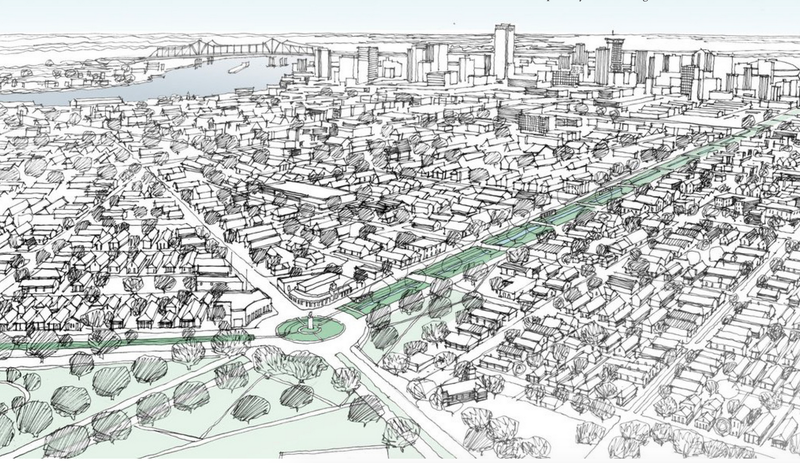 But more to the point, the 10 highways identified take up space that could otherwise be used for housing, parks, and other things that enhance a neighborhood rather than divide it. To be clear, the report does not call for every highway to be replaced with housing, but rather to put in boulevards more in keeping with an urban environment, featuring green space and places for pedestrians to exist without fearing vehicular manslaughter. Cities were never meant to be driven through, they were meant to be driven around. Let the great highway teardown begin.